Work is overrated. Why put yourself through the stress of dealing with that pile of paperwork when you could be playing games? Of course, some strange people (Managers, Directors, weirdos) don’t feel the same way. That is why the good Lord invented internet games. 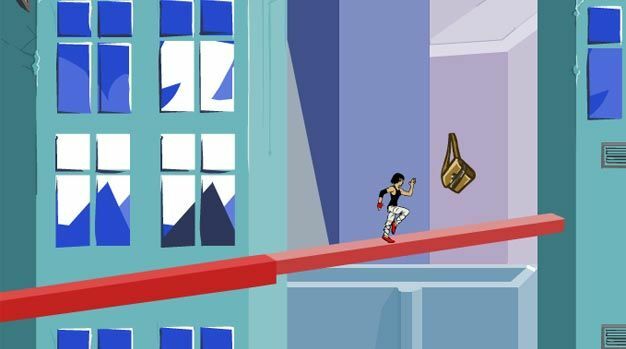 One such flash-based slice of procrastination is the new 2D Mirror’s Edge game. It is currently in beta, with just one level playable. According to Borne Games, the full version (expected in 2 or 3 weeks) will feature a “whole lot more”. What that “whole lot more” is we aren’t sure, but who cares – it’s free and it’s fun. So much fun that the site’s servers are currently having trouble coping with traffic. Don’t worry though, they are on the case and promise to have it sorted soon. When it is up and running again, angle your monitor so nobody can see, put on your best “I must review this report” face and enjoy some 2D parkour action. Just don’t blame us if you get fired.